Orcs & Elves (and Doom RPG): Both by id Software, and I’ve played them for hours – at work, at home, in the bathroom… Everywhere. I love turn-based dungeon crawls. The aforementioned is generic fantasy in the same vein as Eye of the Beholder (for those who remember), sans the confusion of static movement. Doom RPG is essentially the same game, only it’s set on Mars instead of in some Dwarven fortress (come on, you know the story). Half-Elf or Marine? You decide. Tetris: You can’t go wrong with this classic game. Not even on your phone, it seems. Prince of Persia – Sands of Time: Well-crafted and nice to look at, but short. It’s over in half an hour. However, the presentation and crisp animations make up for it. Plenty of traps, too. Might and Magic II: Consider this a fairly standard RPG in every respect, even though the graphics are nice. I’ve only spent a limited amount of time with it, but so far I’ve actually enjoyed myself. Has nothing to do with the strategy game of yore, so don’t get too excited. There you go. Ah, don’t mention it. I have uploaded a small pack containing the five games mentioned above. Feel free to download it. 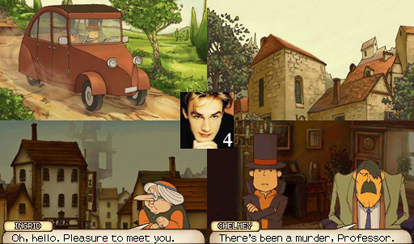 Professor Layton and the Curious Village (the title is reason enough to import this, you hear) is all about puzzles. In fact, you’re constantly bombarded with them for each step you take in this point-and-click adventure, and there’s well over a hundred puzzles for you to solve, with more coming every week as downloadable content. Even though there’s not as much investigating as the title might imply, and even though you might recognize most mechanics of the puzzles presented (if only in that slight familiar way), you need not worry, as there’s plenty to go around before you’re done with this. Now take a look at the character art. Looks like a Studio Ghibli production, right? Damn right. Add some splendid music, wonderfully animated cutscenes and the occasional spoken dialogue, and this Level-5 release is exactly what your heart and soul needs. If not easily swayed by cuteness, you might need to brush up that intellect of yours. Simply adorable. This game has been awarded with high scores overall, and as the last person alive to ever review this game (I was always a late bloomer) and, apparently, one of the last sane reviewers around, I’ll try to explain why almost all before me are incorrect. Brothers In Arms for the Nintendo DS starts out really nice. Graphics certainly impress, you can use cover, the Nazis scream at you in actual German, and the grenade-throwing is especially well implemented. Now, as you progress through early levels, you have high expectations of what’s ahead, but that sweet anticipation is soon muddled by a few too many problems. For starters, controls are unresponsive and imprecise, the cover system turns out to be sluggish and poorly executed, and the initial awe inspired by the graphics soon wears thin. Bugs and framerate issues appear so frequently that you begin to wonder if this game was such a good idea after all. To have a plane dip at me at 8 frames per second really doesn’t impress me that much, neither does breaking through a wall with a tank when there’s no sound to punctuate and accentuate the destruction you’re witnessing on screen. In such situations, the most apparent flaw of Brothers In Arms is becomes crystal clear: It’s so maxed out, so determined to bring the other consoles alarm and audiovisual overload to the DS, that it shoots itself in the foot while attempting to do so. However, the vehicle driving sections deserves mentioning alone, since they are so amped up that it feels like going snowboarding on landscape-coloured snow, really messed up on drugs (any kind of substance where you gnash your teeth into small, sharp splinters), with a World War going on somewhere in the lift area. Oh yeah, and there are Nazis everywhere in the slopes, taking aim, but they can’t hit you, because you’re moving too fast. Good times, indeed. I have been pondering this question lately, as I’ve been tinkering with the notion of introducing a new scoring table for the reviews I occasionally churn out. Coming to conclusion, I have decided to go with The Dawson System. Ranging from 1 to 5 in scale, Crying Dawson represents the lowest score available, continuing with Irritated Dawson, and on to Average Dawson. On the more positive side of the scale we have Intrigued Dawson and finally Happy Dawson, representing the highest score, which would be 5. As not to confuse anyone, I will put in the numbers as well. Any thoughts?